with "IDA/PDPC National Do Not Call (DNC) Registry" before you can Call / Fax / SMS. The cost of checking with IDA/PDPC directly start from 2 Cents, depends on your quantity. 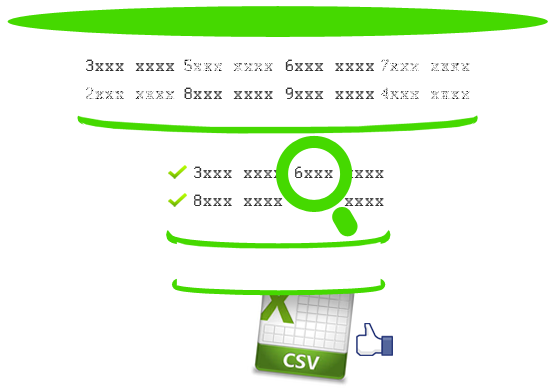 Prepare your database in Excel/CSV/Txt Format & upload to this website. - numbers that are 8 digit numeric long and starts with 3, 6, 8, and 9. STEP 2. We will send the valid numbers to PDPC's website for checking. Once PDPC's website has returned the result to us, we will format the result for you. Then you can download the CLEAN and DO NOT CALL list. Take note of the expiry date. After the expiry date, you will need to recheck your database again. Q. How soon can I receive the result after I submit? Q. What is validity period? Q. How does DNCLookup.sg work? Q. Are my contacts confidential? Q. Is there any setup fee? Q. With the CLEAN database, can I use it with One Way SMS?